When we last looked at the life of Moses he was sitting by a well in the land of Midian. What must have been going through his mind? He was the biological son of Hebrew slaves, raised as the adopted son of a daughter of the Pharaoh of Egypt. As Stephen recited in Acts 7:22 – “And Moses was learned in all the wisdom of the Egyptians, and was mighty in words and deeds.” How quickly things changed. At the age of 40 (Acts 7:23) Moses fled Egypt for a new life in Midian. What would he do there? How would he live? What would become of him? I had my own questions about Moses in 1971. I had been content to be an atheist until three Christians presented evidence in answer to my questions about truth claims concerning Christianity. I wasn’t used to Christians having answers to my questions, so as a journalist I was curious to see where their evidence would go. I looked at the Bible’s information about Moses from a journalistic perspective. I had investigated old stories before, but nothing this old. What was the evidence for Moses’ existence? Was the evidence testable? What about extra-biblical testimony? 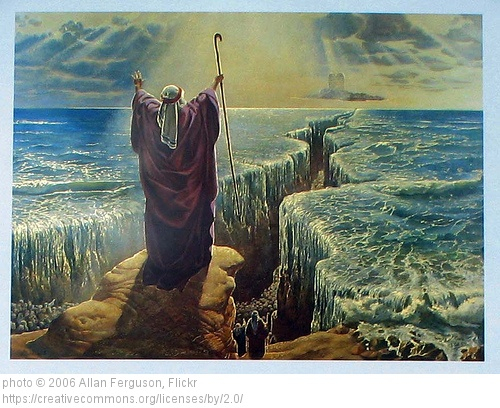 Did the information about Moses in the Bible read like history or mythology? Lots of questions, but what were the answers? And where would those answers lead me in my investigation? Would I find enough evidence to warrant continuing or would the story of Moses end my search for the truth about the existence of God? As an atheist I did not believe in the supernatural, so I looked at the ancient document called Exodus to see whether anything about the life of Moses was naturally possible. What the Bible described as the first 40 years of Moses’ life in Egypt was possible based on a naturalistic worldview. Here’s what the Bible described as the next 40 years of Moses’ life in Midian. Moses sat next to a well. The seven daughters of a Midian priest came to the well to draw water and filled troughs to water their father’s flock. Shepherds came to the well and drove away the women, but Moses stood up and helped them to water their flock. The daughters told their father that “an Egyptian” delivered them from the hand of the shepherds and helped them draw enough water to give to their flock. Their father told his daughters to get the Egyptian and invite him to eat with them. Moses ended up living with the man and his family and eventually married one of the man’s daughters and had two sons with her. The next part of the story was not so easy to believe. In my way of thinking at the time, the story moved from possible history to mythology whenever “God” was mentioned. That’s normal for an atheist. As I continued to ask questions about what was written about Moses in the Book of Exodus, I looked at the interaction between Moses, who appeared to be a normal human being of his time, and God. It’s not easy to be an atheist and take the Bible seriously because many of the stories in it seem so impossible. However, I was challenged to look at the stories in the Bible from the perspective of a journalist investigating whether something could be true or not. I had thought of Bible stories as fanciful tales for the uninitiated minds of children, but did my best to be objective and not bring presuppositional thinking to bear on the ancient document. I thought about what I might do and say if I was in a similar situation and what Moses said and did seemed rational. Moses saw a bush on fire, but not burning up. A rational human response would be to know that what you were seeing was not naturally possible. So, Moses stopped what he was doing and walked toward the burning bush to “see this great sight, why the bush does not burn.” That’s when, according to the Exodus text, Moses heard God’s voice. The character of God seemed almost human in communicating with Moses about what He (God) wanted Moses to do. The character of God expressed a deep love and loyalty to the Hebrew people- both reasonable emotions. He wanted to free them from slavery in Egypt and return them to the land He had promised to Abraham, Isaac and Jacob. As I had seen previously from archaeological discoveries, the people groups identified as Canaanites, Hittites, Amorites and Perizzites existed at the time of Moses in regions north of Egypt (we’ll learn more about them in later posts). Moses was not the typical mythical hero who jumped at the chance to slay dragons and save the fair maiden in distress. His reaction to what God asked him to do was realistic under the circumstances. Look at Moses’ side of the discussion and see if you don’t agree that his reaction to what God asked him to do is anti-hero. What the Bible describes about Moses’ speech and behavior in Exodus might lead the reader to think he was no mere mortal, but mere and mortal is just what he was. That certainly made Moses a more believable character because he exhibited real human traits rather than mythical/legendary traits. In the next part of our investigation, we’ll see what archaeology might tell us about whether Moses may have been the prophet of God who worked miracles in Egypt. I would really like to read this from beginning to end, but am finding myself going in circles trying to navigate to find these in order. Is there somewhere they are listed from the first entry to the last, or would it be possible to have each link emailed to me? Here you mention one thing I have seen throughout the Scriptures… the “heroes” were not typical legendary heroes (like the Greek heroes), but ordinary men with ordinary responses. For me this remains one of the most convincing aspects of the Bible… it deals with real people, showing typical, real human responses.